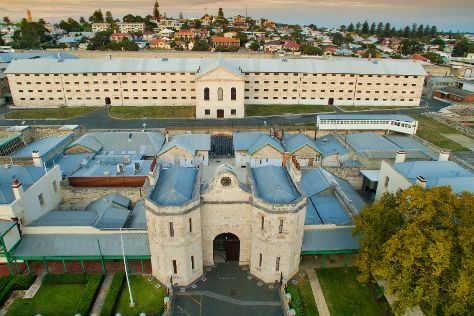 Your cultural itinerary includes sights like Fremantle Prison and The Fremantle Round House. Get in touch with nature at Rockingham Beach and Kayaking & Canoeing. Venture out of the city with trips to Mandurah (Waterskiing & Jetskiing & Dolphin & Whale Watching), Warnbro Beach (in Warnbro) and The Artisan Store Fremantle (in Fremantle). There's lots more to do: kick back and relax at City Beach, stroll through Mullaloo Beach, take in the architecture and atmosphere at St Patrick's Basilica, and contemplate in the serene atmosphere at St. Mary's Cathedral. For photos, ratings, traveler tips, and more tourist information, go to the Perth trip itinerary planner . Zurich, Switzerland to Perth is an approximately 21.5-hour flight. The time zone changes from Central European Time to Australian Western Standard Time, which is usually a 7 hour difference. In December, Perth is much hotter than Zurich - with highs of 35°C and lows of 17°C. Finish your sightseeing early on the 10th (Tue) so you can travel to Albany. Satisfy your inner culture vulture at Princess Royal Fortress and Moombaki Wines. Get outdoors at Emu Point and Little Beach. Get out of town with these interesting Albany side-trips: Denmark (Shelley Beach, Greens Pool, & more), Lowlands Beach (in Lowlands) and Cosy Corner Beach (in Kronkup). Spend the 15th (Sun) exploring nature at Waychinicup National Park. Spend the 17th (Tue) observing fascinating marine mammals with a dolphin and whale watching tour. There's much more to do: kick back and relax at Middleton Beach, take your sightseeing to a higher altitude at Bluff Knoll, stroll through Nanarup Beach, and admire the striking features of The Church of Saint John the Evangelist. To see maps, ratings, and other tourist information, read Albany online day trip planner . Traveling by flight from Perth to Albany takes 3.5 hours. Alternatively, you can drive; or take a bus. In December, Albany is a bit cooler than Perth - with highs of 26°C and lows of 13°C. Finish your sightseeing early on the 18th (Wed) so you can drive to Esperance. Esperance is a town in the Goldfields-Esperance region of Western Australia, on the Southern Ocean coastline approximately 720km east-southeast of the state capital, Perth. Escape the urban bustle at Twilight Bay and Lucky Bay. Relax by the water at Thistle Cove and Hellfire Bay. Spend the 23rd (Mon) exploring nature at Cape Le Grand National Park. Next up on the itinerary: enjoy the sand and surf at Blue Haven Beach, stroll through West Beach, see the interesting displays at Esperance Museum, and cruise along Great Ocean Drive. To find where to stay, more things to do, maps, and tourist information, you can read our Esperance tour itinerary app . You can drive from Albany to Esperance in 5 hours. Other options are to fly; or take a bus. In December in Esperance, expect temperatures between 30°C during the day and 15°C at night. Finish your sightseeing early on the 25th (Wed) so you can travel to Nullarbor. Kick off your visit on the 26th (Thu): explore the wealth of natural beauty at Nullarbor National Park. To see other places to visit, ratings, photos, and tourist information, you can read our Nullarbor trip maker website . Traveling by car from Esperance to Nullarbor takes 14 hours. Alternatively, you can fly. Traveling from Esperance to Nullarbor, you'll lose 1 hour due to the time zone difference. Wrap up your sightseeing on the 26th (Thu) early enough to travel to Glenelg. Kick off your visit on the 27th (Fri): enjoy the sand and surf at Glenelg Beach, trek along River Torrens Linear Park Trail, and then contemplate the long history of Old Gum Tree Reserve. Keep things going the next day: get engrossed in the history at National Railway Museum Port Adelaide, then enjoy the sand and surf at Henley Beach, and then tee off at Glenelg Golf Club. To find ratings, where to stay, photos, and more tourist information, go to the Glenelg travel planner . Explore your travel options from Nullarbor to Glenelg with the Route module. 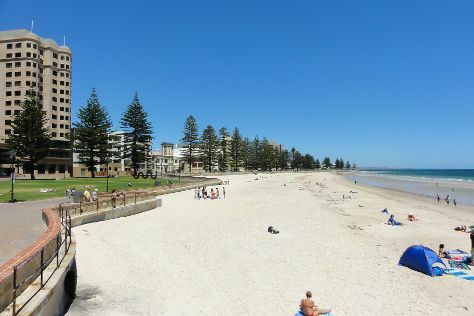 In December in Glenelg, expect temperatures between 30°C during the day and 17°C at night. Finish up your sightseeing early on the 28th (Sat) so you can go by car to Adelaide. We've included these beaches for you: Seacliff Beach and West Beach. Get some historical perspective at Carrick Hill and ISKCON Adelaide. Go for a jaunt from Adelaide to Semaphore to see Semaphore Beach about 32 minutes away. There's lots more to do: find your balance on the water with some of the best stand-up paddleboarding in the area, look for all kinds of wild species at Waterfall Gully, learn about winemaking at Penfolds Magill Estate Cellar Door, and get a new perspective on nature at South Australian Museum. 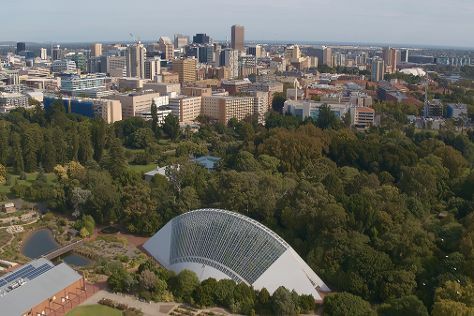 To see maps, reviews, and more tourist information, refer to the Adelaide visit planner. Adelaide is just a short distance from Glenelg. In December, plan for daily highs up to 30°C, and evening lows to 17°C. Wrap up your sightseeing on the 3rd (Fri) to allow time to drive to McLaren Vale. McLaren Vale is a small rural town in South Australia famous for producing world class red wine. Escape the urban bustle at Aldinga Beach and Port Noarlunga Reef. Do some cultural sightseeing at Fox Creek Wines and Oliver’s Taranga Vineyards Cellar Door and Winery. It doesn't end there: kick back and relax at Maslin Beach and learn about winemaking at Old Oval Estate. To find traveler tips, more things to do, photos, and more tourist information, go to the McLaren Vale online tour itinerary builder . Traveling by car from Adelaide to McLaren Vale takes an hour. Alternatively, you can take a train; or take a bus. In January in McLaren Vale, expect temperatures between 34°C during the day and 19°C at night. Wrap up your sightseeing on the 9th (Thu) to allow time to drive to Hahndorf. Hahndorf is a small town in the Adelaide Hills region of South Australia. Get some cultural insight at National Motor Museum and O'Leary Walker Wines Adelaide Hills. Eschew the tourist crowds and head to Gorge Wildlife Park and Hahndorf Hill Winery. And it doesn't end there: look for all kinds of wild species at Cleland Wildlife Park, take in the pleasant sights at Bridgewater Fairy Garden, do a tasting at Deviation Road Winery, and take in nature's colorful creations at The Cedars. To see traveler tips, photos, ratings, and other tourist information, read Hahndorf route planner. You can drive from McLaren Vale to Hahndorf in an hour. Other options are to do a combination of train and bus; or take a bus. In January, plan for daily highs up to 34°C, and evening lows to 19°C. Finish up your sightseeing early on the 12th (Sun) so you can go by car to Warrnambool. Warrnambool is a regional centre and former port city on the south-western coast of Victoria, Australia. Do some cultural sightseeing at Griffiths Island Lighthouse and Tower Hill Cemetery. Explore hidden gems such as Bay of Islands and Logan's Beach. When in Warrnambool, make a side trip to see Port Fairy Historical Society in Port Fairy, approximately 36 minutes away. There's lots more to do: head off the coast to Griffiths Island, see the interesting displays at Flagstaff Hill Maritime Village, stroll through Lake Pertobe Adventure Playground, and explore the galleries of Whale Bone Studio Arts. To find ratings, traveler tips, other places to visit, and other tourist information, refer to the Warrnambool travel itinerary planner . Traveling by car from Hahndorf to Warrnambool takes 6.5 hours. Alternatively, you can do a combination of bus and flight; or do a combination of bus, flight, and train. Wrap up your sightseeing on the 15th (Wed) early enough to take a bus to Port Campbell. Port Campbell is a coastal town in Victoria, Australia. Escape the urban bustle at Gibsons Steps and Loch Ard Gorge. Step off the beaten path and head to The Arch and The Grotto. Spend the 17th (Fri) exploring nature at Port Campbell National Park. Next up on the itinerary: kick back and relax at Port Campbell precinct and foreshore and take in the dramatic natural features at The Twelve Apostles. To see traveler tips, other places to visit, where to stay, and tourist information, read our Port Campbell trip itinerary maker app . You can take a bus from Warrnambool to Port Campbell in an hour. Alternatively, you can drive. Cap off your sightseeing on the 18th (Sat) early enough to go by car to Lorne. Lorne is a seaside town on Louttit Bay in Victoria, Australia. Satisfy your inner culture vulture at Split Point Lighthouse and The Lorne Pier. 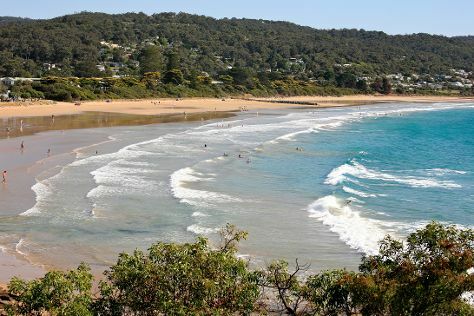 You'll discover tucked-away gems like Lorne Beach and Mait's Rest. Change things up with these side-trips from Lorne: Apollo Bay (Great Ocean Walk & Mariners Lookout). Make the 21st (Tue) an awe-inspiring day at Won Wondah & Henderson Falls. And it doesn't end there: make a trip to Teddy's Lookout, get engrossed in the history at Great Ocean Road Story, and take in the dramatic scenery at Sheoak Falls. To see more things to do, other places to visit, traveler tips, and other tourist information, refer to the Lorne trip itinerary tool . Drive from Port Campbell to Lorne in 2 hours. Alternatively, you can take a bus. Expect a daytime high around 30°C in January, and nighttime lows around 16°C. Wrap up your sightseeing on the 22nd (Wed) to allow time to drive to Werribee. Werribee is a suburb of Melbourne, Victoria, Australia, 32 km south-west of Melbourne's Central Business District, located within the City of Wyndham local government area. 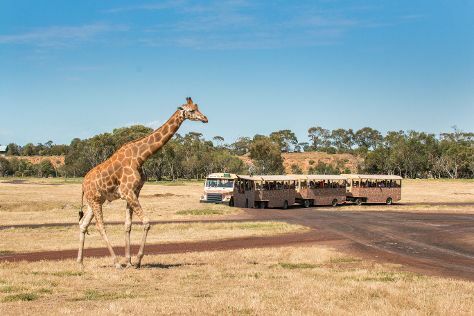 Step out of the city life by going to Werribee Open Range Zoo and Adrenaline & Extreme Tours. Eschew the tourist crowds and head to RAAF Museum and Victoria State Rose Garden. Take a break from Werribee with a short trip to Cherry Lake Altona in Altona, about 34 minutes away. There's much more to do: see the interesting displays at Scienceworks, tour the pleasant surroundings at Werribee River Park, identify plant and animal life at Heathdale Glen Orden Wetlands, and get great views at K Road Cliffs. To find other places to visit, where to stay, photos, and more tourist information, use the Werribee road trip planner . Traveling by car from Lorne to Werribee takes 1.5 hours. Alternatively, you can do a combination of bus and train; or take a bus. In January, plan for daily highs up to 30°C, and evening lows to 17°C. Finish your sightseeing early on the 25th (Sat) to allow enough time to drive to Torquay. 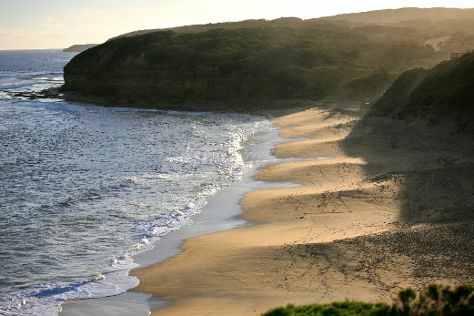 Explore hidden gems such as Bells Beach and Point Addis Marine National Park. Get outdoors at The Great Ocean Road and Fisherman's Beach. There's more to do: enjoy the sand and surf at Torquay Front Beach and tour the pleasant surroundings at Point Roadknight. To see other places to visit, where to stay, more things to do, and tourist information, refer to the Torquay tour app . Getting from Werribee to Torquay by car takes about an hour. Other options: take a train; or do a combination of train and bus. In January, plan for daily highs up to 30°C, and evening lows to 16°C. Cap off your sightseeing on the 28th (Tue) early enough to travel back home.